"Whoever gets in there will be unstoppable." Universal has debuted the first trailer for The Huntsman: Winter's War, the sequel to 2012's Snow White and the Huntsman that no one asked for but they made anyway. Chris Hemsworth returns as The Huntsman, and Charlize Theron as the evil Queen, but they've also lined up two great actresses to join: Jessica Chastain and Emily Blunt. Unfortunately, this looks like a terrible CGI-fest without much substance. In fact, it looks like they're trying to replicate Disney's Frozen in a more gritty, live-action way. And that just irks me and makes me despise this, but give it a look. The fantastical world of Snow White and the Huntsman expands to reveal how the fates of The Huntsman Eric and Queen Ravenna are deeply and dangerously intertwined. Long before the evil Queen Ravenna (Theron) was thought vanquished by Snow White's blade, she watched silently as her sister, Freya (Blunt), suffered a heartbreaking betrayal and fled their kingdom. With Freya's ability to freeze any enemy, the young ice queen has spent decades in a remote wintry palace raising a legion of deadly huntsmen—including Eric (Hemsworth) and warrior Sara (Chastain)—only to find that her prized two defied her one demand: Forever harden your hearts to love. The Huntsman: Winter's War is directed by VFX veteran Cedric Nicolas-Troyan making his feature debut. 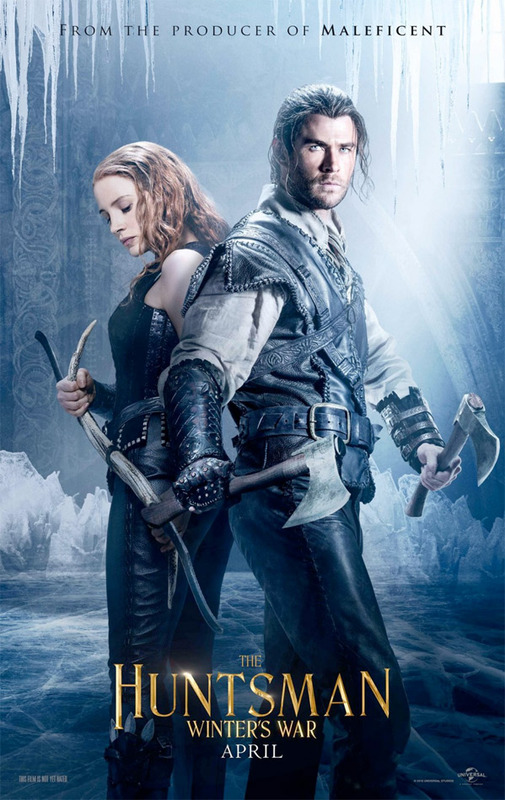 Universal releases The Huntsman on April 22nd, 2016. I didn't mind it. Actually looks better than the first to me. Wasn't crazy about Kristen Stewart's performance as Snow White. Theron was the best part of it and she's in it again. Adding two other great actresses couldn't hurt either. the CGI doesn't bother me - all the ridiculous lines being spoken does.....I wasn't thrilled with the first movie; so, I'm giving this a pass. I don't recall those kinds of lines being spoken other than when talking to the mirror/casting spells. I think the sing song rhyming fits the movie well... the heavy metal music overlaying the scenes turns me off. well, I can't argue with you - we both have opinions....and mine is the dialogue is forced and ridiculous. as far as the music goes, I agree. Fabulous cast of women! Like a DREAM TEAM. It is quite the shame they are together, but making this mediocre level thing. Having said that, it still looks like B-level entertainment and that is okay by me. Craig Mazin co-wrote this? OK no need to see it. I know it'll be bad. Why does that guy get hired still? CGI actually looks decent and it looks like they used a bit of practical effects too. It looks better the World of Warcraft and Gods of Egypt at least. The story is the only thing that will kill it. Quite a cast though. Might check it out. Could be a hit or a complete disaster. "the sequel to 2012's Snow White and the Huntsman that no one asked for but they made anyway." Thank you, Alex. Jessica Chastain, what are you doing? Emily Blunt, what are you doing? That shot with the age-transition to mature Hemsworth, along with a few others, look somewhat inspired. Other than that, it still looks pretty much looks like something designed by a committee. That was a great movie. I wonder how come no trailers came out before it. I don't get it. Is this a sequel or a prequel? You are genuinely concerned, aren't you? Jessica Chastain is...RED SONJA Looks like fun...glad to see Hemsworth back in action.